Staff it and they will build ...something: If the consultant is truly “independent", they will have no interest in building a software solution. However, if they feel they can build the solution because they are leaving money on the table, they cobble together a development team made up of independent contractors and possibly partner with a small development firm that allows them to act like a general contractor, but none of the project team is an employee. This loosely organized tech team may not have the appropriate skill or bandwidth to complete the project, nor have many of them ever worked together before and they each may have different approaches and methodologies to develop the software. Analyzing and building are two different things: This is the "no duh" statement but often overlooked. Just because a consultant can analyze and document business and technical requirements does not mean they have the vision or skill to build a solution that meets requirements. Think architect versus carpenter. Building a custom solution can get very messy very quickly and unless the consultant has the software development discipline (i.e., Agile experience), requirements will go unmet, shortcuts will be taken, and I venture to guess the schedule will be missed. Where is the “independence”? : Having an independent consultant bring together and lead the development team to build a solution is a lot like asking a lawyer to pick the judge they want for their trial. Of course the lawyer will pick the judge who sides with them more often. The same is true for a consultant who brings in a development team. It’s a biased situation. No one is really creating the checks and balances to hold the development team accountable. If the consultant remained independent, there would be a separation of church and state and a better likelihood that the project would succeed. The observations above are all situations that we have encountered over the past 15 years since we started RSI Content Solutions. This is not to say that some independent consultants can’t pull off a software development project, but in our experience these projects usually don’t end well. How do we know this? RSI was once the “independent” consultant who one day was asked to build out a CMS. It felt so right, but quickly we learned we needed to operate differently and we did struggle. We eventually got it right, but it was a lesson from over 10 years ago that we still remember. Our suggestion is to make sure you keep your “independent” consultant truly independent and let the software solutions up to the people who do it every day. 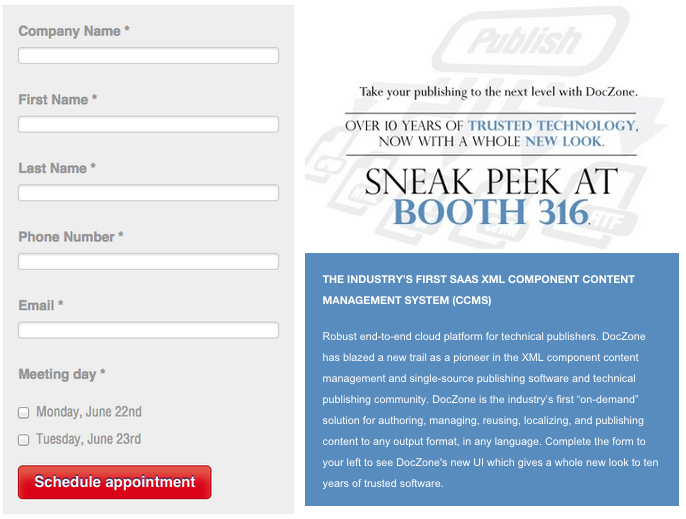 DocZone, a component content management system for technical publications, unveiled their new user interface at booth 316 the STC Technical Communication Summit in Columbus, OH. This latest version of DocZone provides an entirely new user experience through an intuitive user interface that minimizes actions required to store, search, tag and reuse content while allowing users to quickly and efficiently publish their technical documents to multiple formats and languages. For fifteen years, RSI Content Solutions has been a trusted content management solutions provider for both traditional and technical publishers alike. 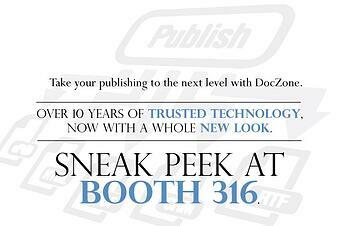 Learn how organizations with technical publishing needs like Citrix, Epson, ITT, Cummins, Kyocera, and many others use DocZone at www.doczone.com. 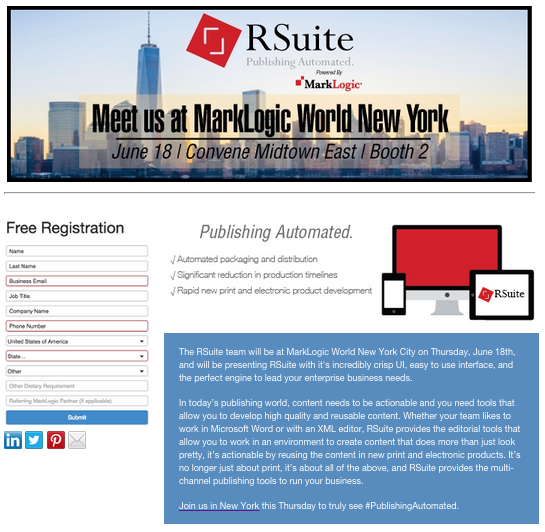 RSuite Sponsors MarkLogic World NY | Free Registration!